The ultra-exclusive Aston Martin Rapide E was revealed in production-ready form today at the Shanghai auto show. 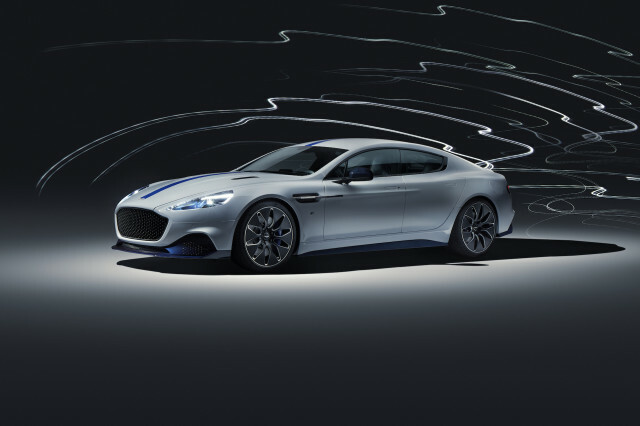 The 2020 Rapide E is based on the Rapide AMR, the most extreme-performance version of the gasoline-powered Rapide sedan. It’s seen by Aston concurrently as a path into electric cars as well as another in a long line of special-edition models, such as the Aston Martin Vulcan—a lightweight, track-only car that cost $2.3 million. It's expected to cost quite a bit less than that—although pricing itself hasn’t been announced. Only 155 examples of the Rapide E will be built at St. Athan, UK, as part of a new hub for electric-vehicle expertise. This electric super-sedan’s path to production hasn’t exactly been smooth, since Aston Martin originally revealed the concept in 2015, so kudos to Aston Martin for keeping its flagship electric model (mostly) on time. The delay of perhaps a year carries a backstory. The Rapide E—or RapidE, as it was known as a concept—was to be co-developed by LeEco, a Chinese company that had started to develop its own electric cars but was up until then known as “the Netflix of China.” LeEco had close ties to Faraday Future; founder of LeEco, Jia Yueting, remains the CEO of Faraday Future. In June 2017 Aston announced that it would instead partner with Williams Advanced Engineering—the company that works with McLaren Applied Technologies and Lucid (otherwise called Atieva) to provide batteries for Formula E racing. 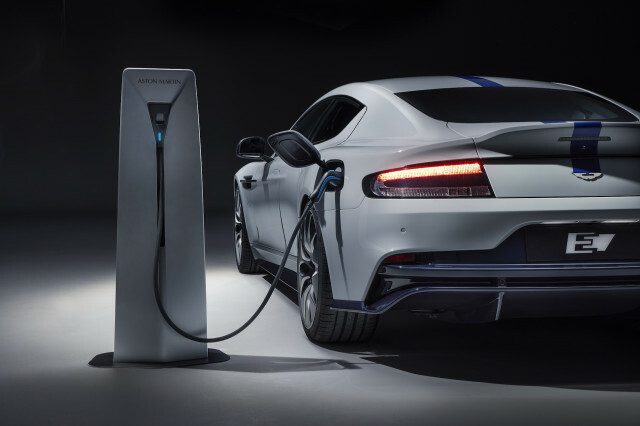 According to Aston, the Rapide E can recover energy at a rate of 310 miles of range per hour with (CCS) DC fast charging at 800 volts and 100 kw, or 185 miles per hour on the 400-volt, 50-kw fast chargers that are common today. An AC onboard charger can give the battery a full charge in just three hours. CHECK OUT: Will Aston Martin Rapide E be James Bond’s new electric ride? The “bespoke” 65-kwh battery pack is installed where the 6.0-liter V-12, gearbox, and fuel tank would otherwise be and includes 5,600 lithium-ion cells in the cylindrical 18650 format that Tesla uses in the Model S and Model X. Aston has not yet specified its supplier. Keeping the battery pack at that size helps keep weight under control, though; curb weight is under 4,400 pounds, meaning a Tesla Model S weighs more than 500 pounds extra. The Rapide E can, as promised early in its development, get to a top speed of 155 mph and do a full lap of the Nürburgring with no performance loss. 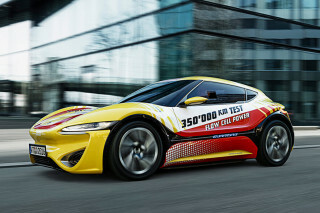 It can accelerate to 60 mph in less than 4.0 seconds and from 50 to 70 mph in 1.5 seconds. Range is definitely not the emphasis here. Aston says that under the WLTP standard for Europe and elsewhere, the Rapide E be rated for 200 or more miles of range. That would likely place it in the 150- to 180-mile range, by tougher U.S. EPA cycles. The layout seems entirely for track performance, not all-weather street driving. 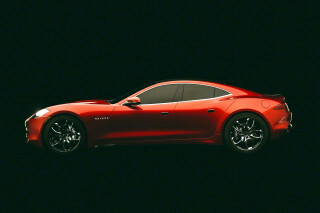 Two rear-mounted motors providing a combined 602 horsepower and 701 pound-feet of torque. They connect to a 6.099 final drive ratio, with a mechanical limited slip differential and wide 21-inch Pirelli P-Zero performance tires. A three-stage adaptive damping system and three-stage stability control system offer flexibility to the driver. The steering is electro-hydraulic. With the second-generation Tesla Roadster not due until next year, Aston Martin might have hit just the right spot for its own enthusiasts who want to go tailpipe-free and Tesla owners who want something beyond Ludicrous.